Hello!! 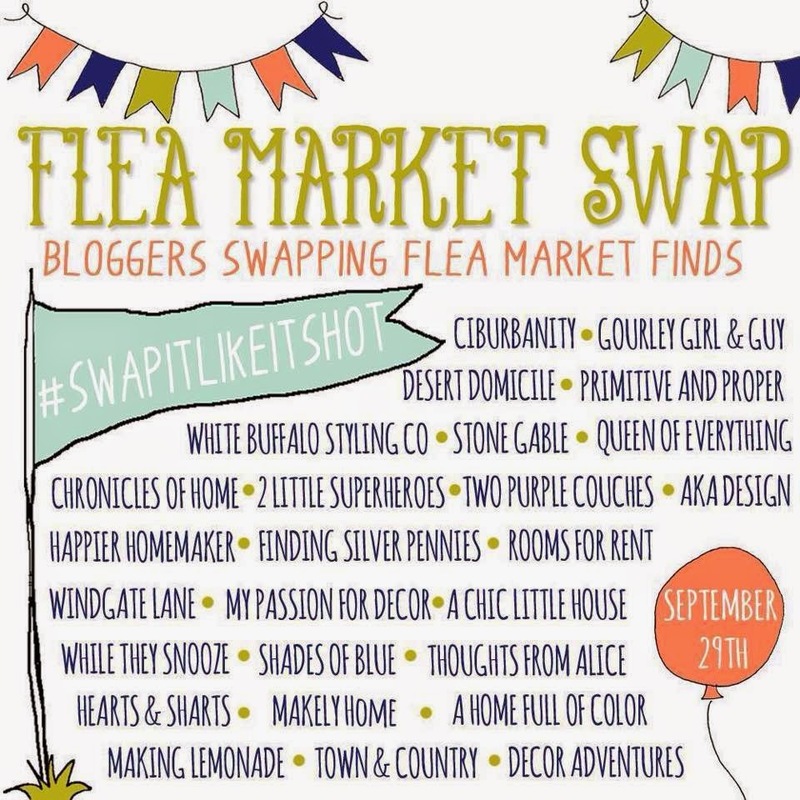 It's that time again...time for some fun flea market swapping!! 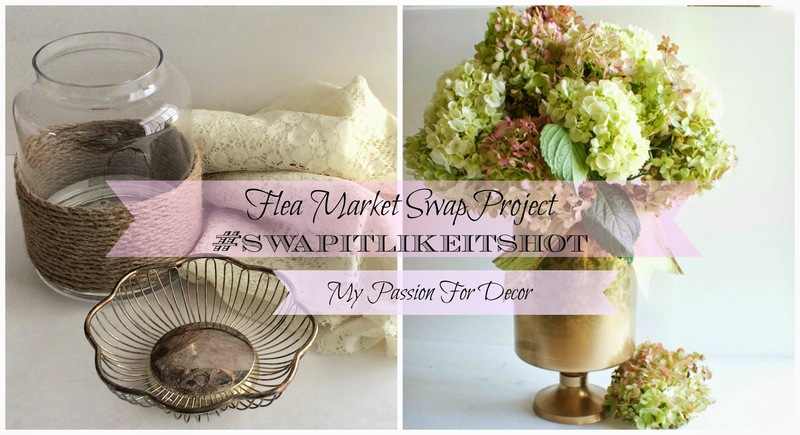 For #swapitlikeitshot part 2 we have more bloggers joining in the fun a total of 26. 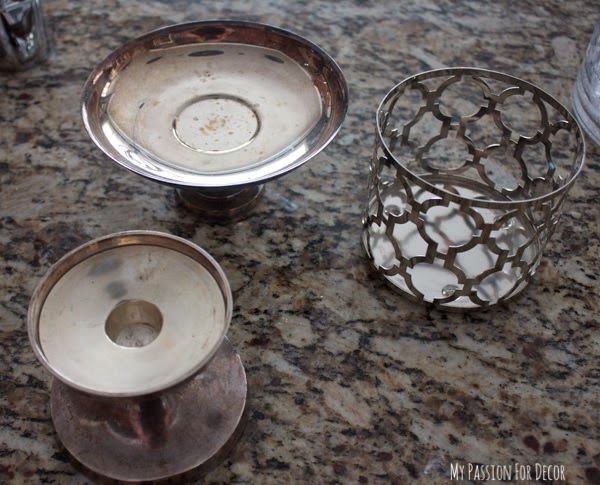 Make sure to stop all the other blogs and see what everyone made with their flea market finds. This time around it was my friend Jessica, from Gourley Girl and Guy's turn to send me some flea market treasures. 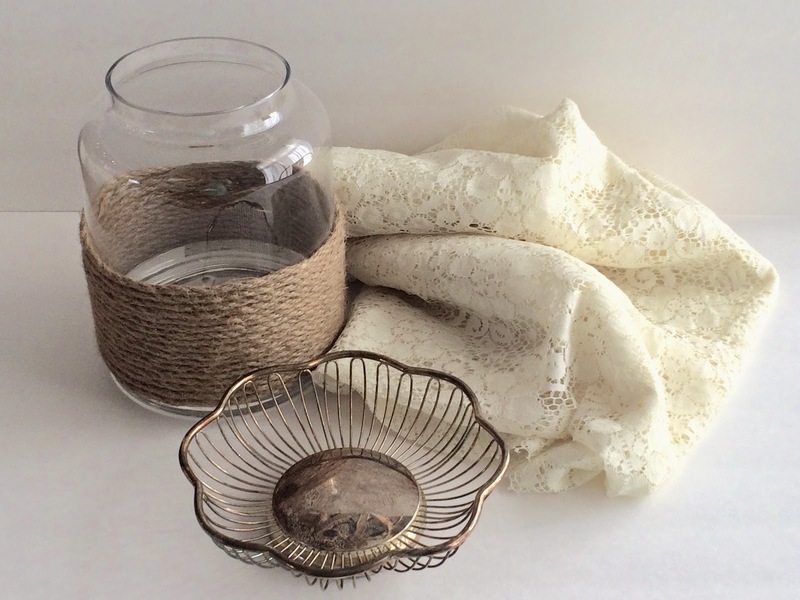 Jessica sent me a glass vase, a silver plate bread basket and a small lace panel. The minute I opened the box and saw what was inside I knew what I'd do to these beauties. However, life being the way it is....I procrastinated until yesterday to start on my project. In my mind I thought, "Hey this will be easy, why do it now when I have so many other things to do?" Luckily, it wasn't hard at all and things went alright...PHEW! The first thing I needed to do was take the jute rope off the glass container. Once I got that off I had a bit of double sided tape to remove with some soap and water and a bit of elbow grease. What I didn't realize, until I got the rope off was inside the container was an epoxy type material that was a bit trickier to get remove, but with a bit of work it all came out. 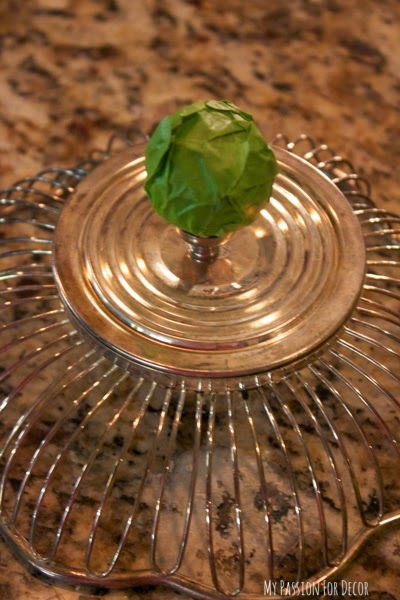 My original plan for all these pieces was to make a lantern, using the lace as a stencil and the bread basket as a lid. 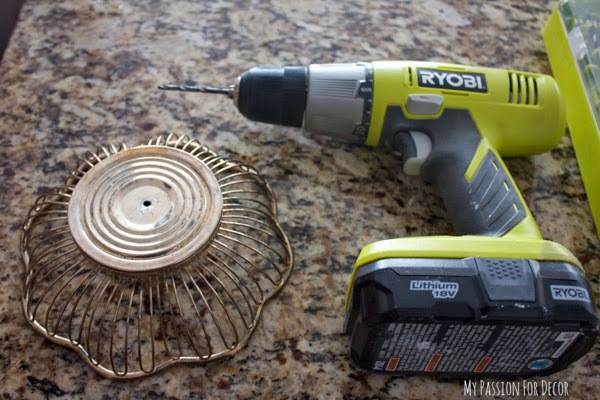 I wanted to add a handle to the top of the lid/bread basket so I drilled a hole in the basket using my trusty Ryobi cordless drill. Once I had my hole drilled and my handle in the top of the lid, I taped up the knob so I could spray paint the lid and the base of the handle. For the handle I used a knob I had left over from another project. The knob is a pretty cut glass drawer pull from Hobby Lobby. I found this candle holder at Goodwill a couple of years ago and wasn't using it and it was the perfect size for my lantern. Notice all the bubbles? I hadn't finished rinsing the container yet...I couldn't wait any longer to get going! 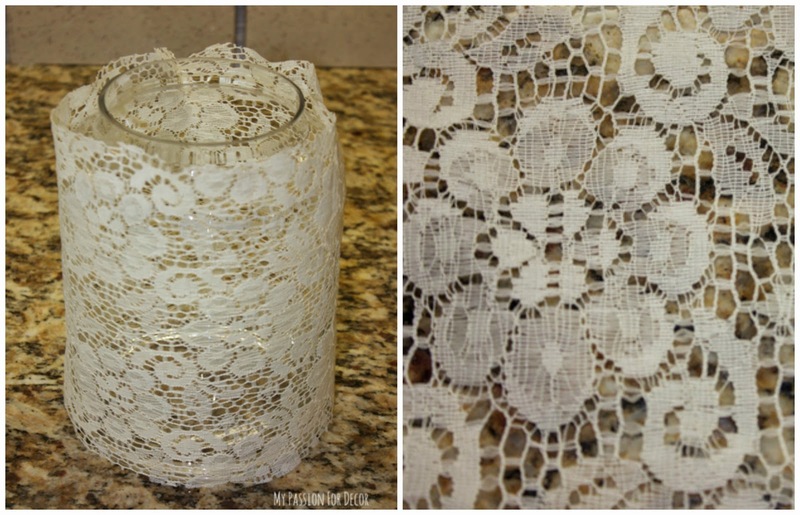 Once my jar was nice and clean I took my lace and cut a piece to size and lightly taped it on my glass container with a few pieces of Frog Tape™. To be honest, this was the hardest part of the whole process. Trying to keep the slippery lace in place was tricky (oh yeah that rhymed!). 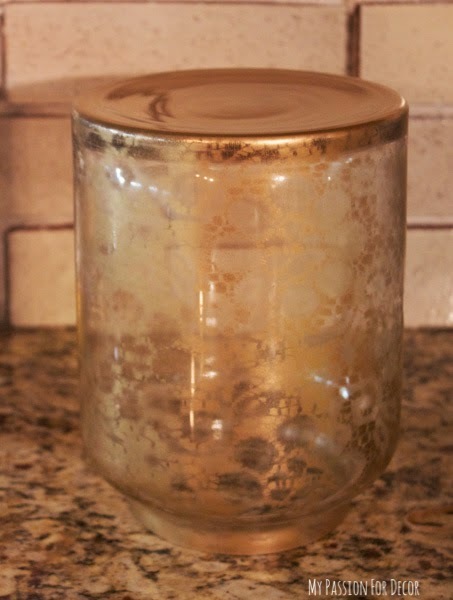 This is how the lantern looked after I sprayed the glass with Valspar gold metallic spray paint. I like how the lace pattern is there, but subtle and opaque. 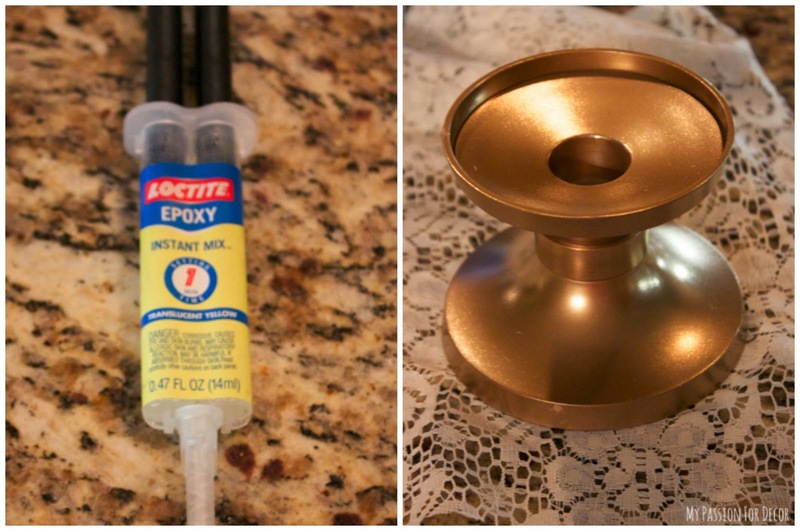 I spray painted the candle holder I was using as the lantern base in the same gold spray paint. Then I put a bead of Loctite epoxy around the edge and placed the glass container on top of that. Within a minute I had a great seal. 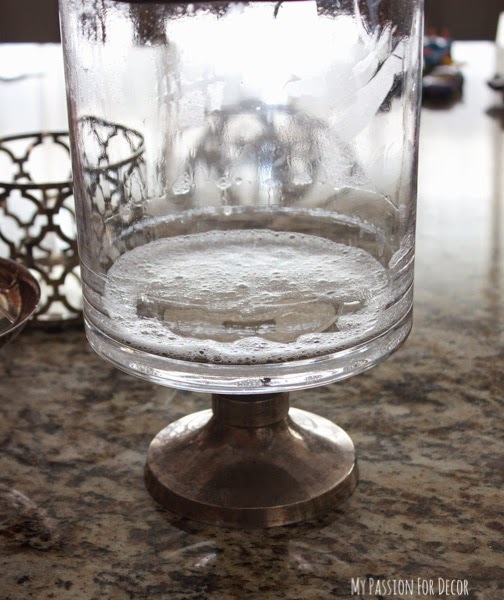 After attaching the base to the lantern, I was all done...or so I thought! I wasn't thrilled with how it turned out and felt like it looked a bit boring. So I took the whole thing back out and gave it a bit more spray paint at the top and bottom of the glass. 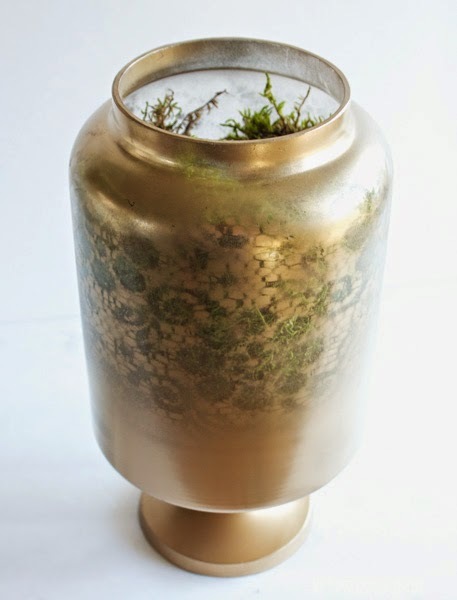 In the process of spray painting, it dawned on me that I could also use this as a vase too. 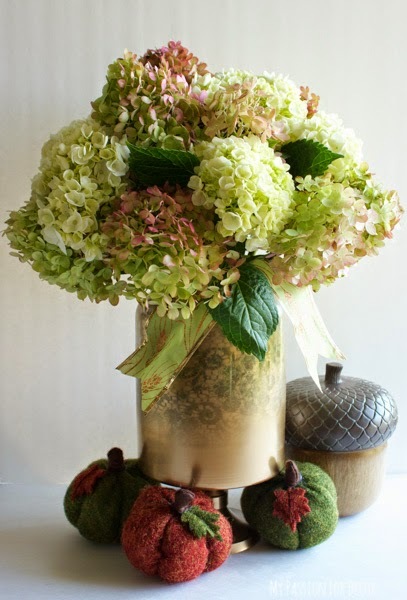 I had bought some hydrangeas and picked some more from the yard earlier in the day, so it was perfect timing for a vase. I had some sheet moss on hand (again leftover from another project) and a Ball™jar. 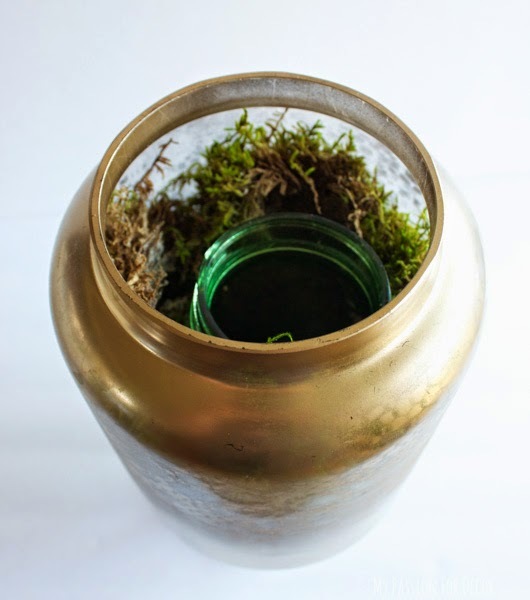 I put some rocks in the bottom of the glass, then added the Ball™ jar and surrounded the jar with the sheet moss. All I needed to do was add my flowers and a little ribbon and I was done. Here's my lantern/vase all done! 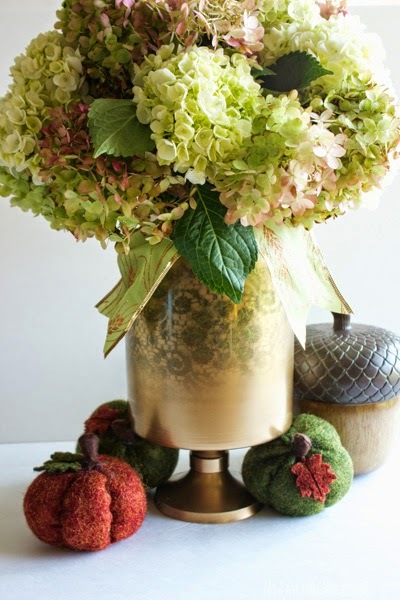 And here it is with some fall decor. 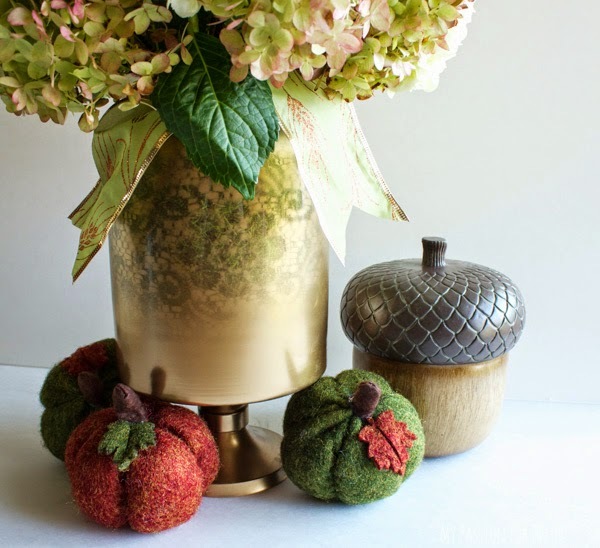 These cute little felted pumpkins I bought this week at Target in the $1 section. 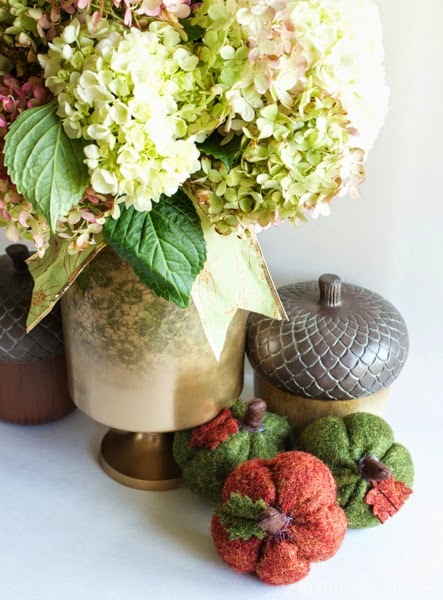 The large acorns I bought last year at Home Goods. 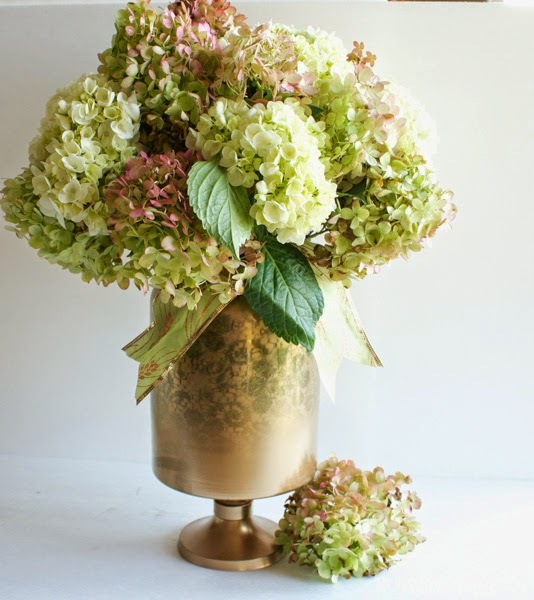 Hydrangeas are one of my favorite flowers and think they look stunning in my new vase! Remember I mentioned earlier how I'd planned on using this as a lantern? Well, here it is as a lantern....this is a double purpose project! 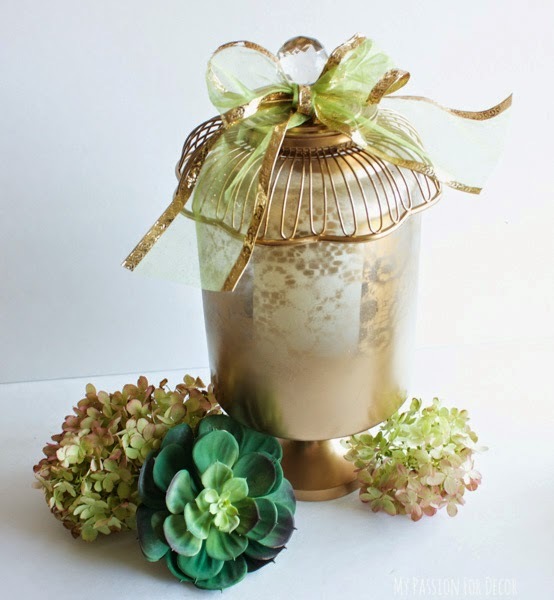 Just add the lid, some ribbon and a flame less LED candle and it's a lantern. I might have gotten a bit carried away, but I wanted to show how changing up the ribbon gave the lantern a whole new look. There you have it folks, a quick and easy flea market swap. The possibilities are endless! 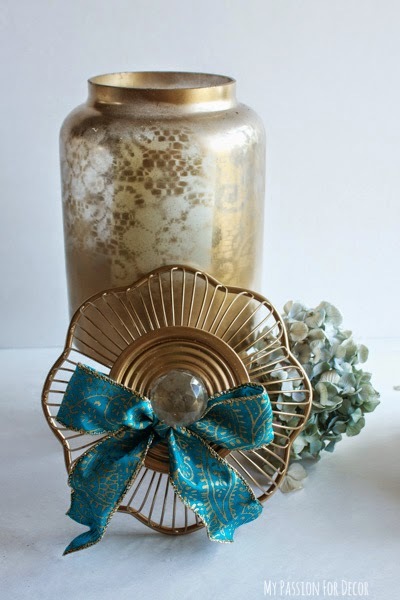 I had a lot of fun doing this and can't wait to see what the other 25 bloggers did with their flea market treasures. 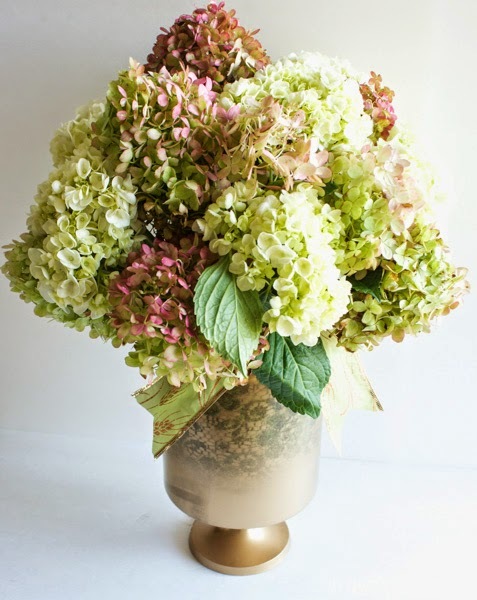 Be sure and check out what Lindsay from The White Buffalo Styling Co. did with what I sent her! I'm interested to see what she does with the items I sent her! NOW, it's your time to shine! 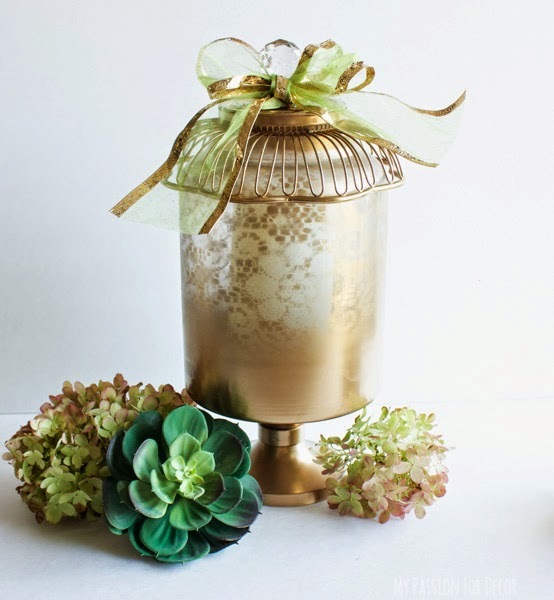 Link up your flea market flips, your up cycles, your makeovers....I want to see what you've been up to. If you don't have a blog, don't worry, as long as you have a Pinterest account you can link up your pinned project using your URL. 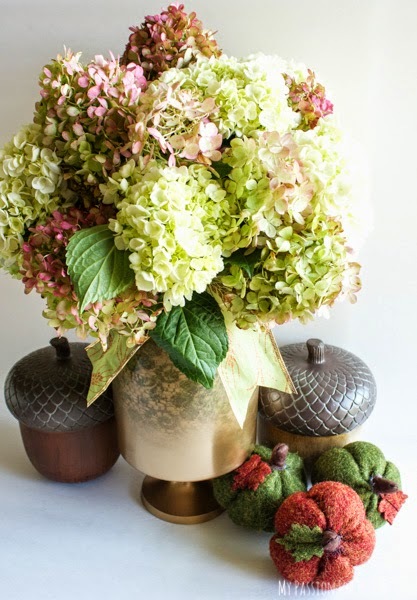 During the week I'll be picking some of my favorites and sharing them via the blog, Facebook, Twitter and Instagram! So be sure to follow me there so you can see what everyone is sharing. Here are the links to everyone participating in the swap! I can't believe that is the same stuff! you are a genius. I could never have thought to do all that and your photography of it was just amazing! You are truly gifted my friend! That looks awesome... you're one smart cookie, I love this idea! Thank you Laurie...You should join us next time! 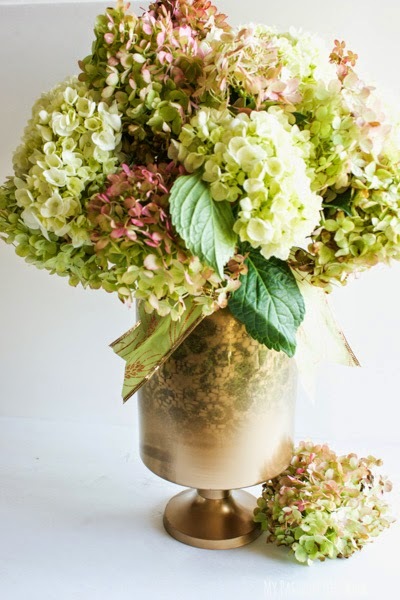 Oh my gosh, this is a total makeover, you used every item, I love it! And now you have multi-seasonal decorations too! Great before and afters girl! Looks so beautiful Mel!! Great job! how fun, melody! love the idea you had for the lace! and i love that you used it all! I LOVE THIS!!!!! Girl, you are good! 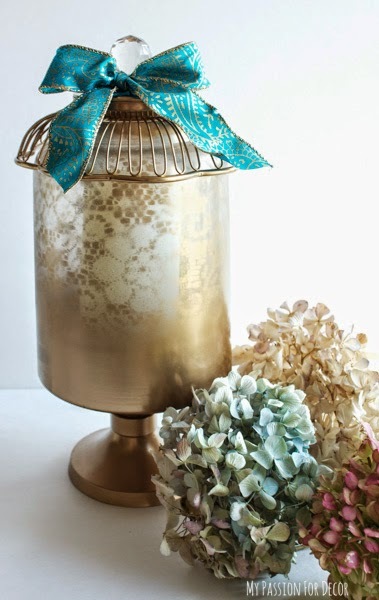 The spray paint & lace almost gives it a mercury glass look, which I adore, and the multi-purpose-ness is genius! Thank you Emily!! I loved your projects as well...that cork board is still on my mind! How fun is this! Visiting all! Thanks for stopping by Debbie!! I hope you enjoyed all the fun posts. The swap it thing is such a fun idea! Yours turned out so pretty! Way to use your creativity! I think the lid is my favorite part!! SO smart! 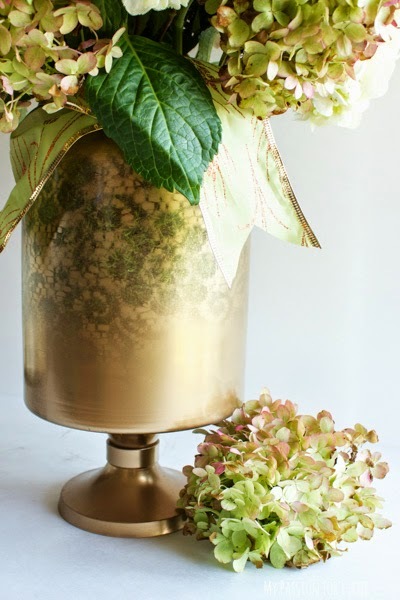 I mean, I love the hydrangea vignette too, but the lid is sneaky great. Melody, HOW CREATIVE!!!! And very pretty! I love the basket as the lid! Brillliant! Thank you Yvonne!! Means so much coming from such a talented lady like you!!! LOL Thanks for sending me such fun stuff Jessica!! Gorgeous makeover! The lace touch was just genius. Wow! I would've never thought to do this. 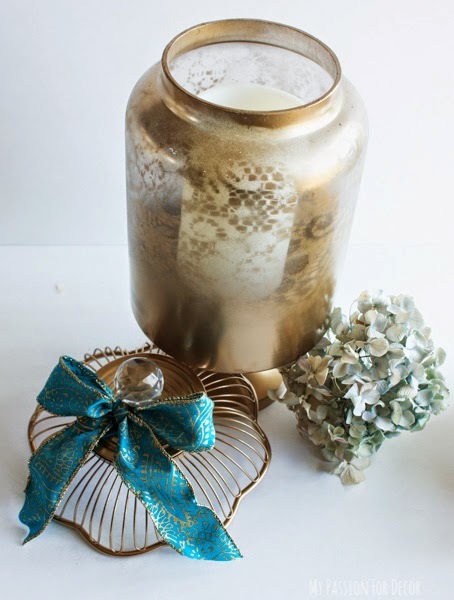 Love the lace effect on the jar!